The Quaker Mill Company of Ravenna, Ohio (founded 1877), which held the trademark on the Quaker name and was acquired in 1901 by Henry Parsons Crowell, who also bought the bankrupt Quaker Oat Mill Company, also in Ravenna. He held the key positions of general manager, president and chairman of the company from 1888 until late 1943. He was called the cereal tycoon. He donated more than 70% of his wealth to the Crowell Trust. The Rob Lewis & Co. American Oats and Barley Oatmeal Corporation. Formally known as "Good For Breakfast" instant oatmeal mix. The company expanded into numerous areas, including other breakfast cereals and other food and drink products, and even into unrelated fields such as toys. Quaker Oats in Cedar Rapids, Iowa, was photographed during the 1930s by Theodor Horydczak, who documented the building, operations, and factory workers at the plant. During World War II, the company, through its subsidiary the Q. O. Ordnance Company, operated the Cornhusker Ordnance Plant, which manufactured millions of pieces of various artillery munitions (41 warehouses and 219 magazines of total 280,800 ft² were built). In 1968, a plant was built in Danville, Illinois. This plant currently makes Aunt Jemima pancake mixes, Oat Squares, Life Cereals Quaker Oh's, Bumpers, Quisp, King Vitamin Natural Granola Cereals, and Chewy granola bars, as well as Puffed Rice for use as an ingredient for other products in other plants. In 1969, Quaker acquired Fisher-Price, a toy company and spun it off in 1991. In the 1970s, the company financed the making of the film Willy Wonka & the Chocolate Factory, obtaining in return a license to use a number of the product names mentioned in the movie for candy bars. In 1982 Quaker Oats purchased US Games, a company that created games for the Atari 2600. It went out of business after one year. That same year, Quaker Oats acquired Florida-based orange juice plant Ardmore Farms, which it would own until selling it to Country Pure Foods in 1998. In 1983, Quaker bought Stokely-Van Camp, Inc., makers of Van Camp's and Gatorade. Quaker bought Snapple for $1.7 billion in 1994 and sold it to Triarc in 1997 for $300 million. Triarc sold it to Cadbury Schweppes for $1.45 billion in September 2000. It was spun off in May 2008 to its current owners, Dr Pepper Snapple Group. In 1996, Quaker spun off its frozen food business, selling it to Aurora Foods (which was bought by Pinnacle Foods in 2004). In August 2001, Quaker was bought out by Pepsico. The major Canadian production facility for Quaker Oats is located in Peterborough, Ontario. The factory was first established as the American Cereal Company in 1902 on the shores of the Otonabee River during that city's period of industrialization. At the time, the city was known as "The Electric City" due to its hydropower resources, attracting many companies to the site to take advantage of this source. The Trent–Severn Waterway also promised to provide an alternate shipping route from inland areas around the city, although it appears this was never used in practice. On 11 December 1916, the factory all but completely burned to the ground. When the smoke had settled, 23 people had died and Quaker was left with $2,000,000 in damages. Quaker went on to rebuild the facility incorporating the few areas of the structure that were not destroyed by fire. When PepsiCo purchased Quaker Oats in 2001, many brands were consolidated from facilities around Canada to the Peterborough location—which assumed the new QTG moniker (Quaker Tropicana Gatorade). Local production includes Quaker Oatmeal, Quaker Chewy bars, Cap'n Crunch cereal, Aunt Jemima instant pancake mixes and pancake syrups, Quaker Oat Bran and Corn Bran cereals, Gatorade sports drinks and the Propel fitness water sub-brand, Tropicana juices, and various Frito-Lay snack products. Products are easily identified by the manufactured by address on the packaging. The Peterborough facility exports to the majority of Canada and limited portions of the United States. The Quaker plant sells cereal production byproducts to companies that use them to create fire logs, pellets and janks. Starting in 1902, the company's oatmeal boxes came with a coupon redeemable for the legal deed to a tiny lot in Milford, Connecticut. The lots, sometimes as small as 10 feet by 10 feet, were carved out of a 15-acre, never-built subdivision called "Liberty Park". A small number of children (or their parents), often residents living near Milford, redeemed their coupons for the free deeds and started paying the extremely small property taxes on the "oatmeal lots". The developer of the prospective subdivision hoped the landowners would hire him to build homes on the lots, although several tracts would need to be combined before building could start. The legal deeds created a large amount of paperwork for town tax collectors, who frequently couldn't find the property owners and received almost no tax revenue from them. In the mid-1970s, the town put an end to the oatmeal lots with a "general foreclosure" condemning nearly all of the property, which is now part of a BiC Corporation plant. In 1955, Quaker Oats again gave away land as part of a promotion, this one tied to the Sergeant Preston of the Yukon television show in the United States. The company offered in its Puffed Wheat and Puffed Rice cereal boxes genuine deeds to land in the Klondike. 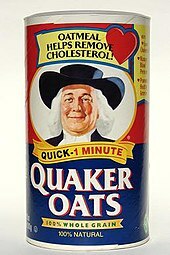 The Quaker Oats logo starting in 1877 had a figure of a Quaker man depicted full-length, sometimes holding a scroll with the word "Pure" written across it, resembling the classic woodcuts of William Penn, the 17th-century philosopher and early Quaker. Quaker Oats advertising dating back to 1909 did, indeed, identify the "Quaker man" as William Penn, and referred to him as "standard bearer of the Quakers and of Quaker Oats." Today, the company states that "The 'Quaker man' does not represent an actual person. His image is that of a man dressed in Quaker garb, chosen because the Quaker faith projected the values of honesty, integrity, purity and strength." In 1946, graphic designer Jim Nash created a black-and-white head-and-shoulders portrait of the smiling Quaker Man, and Haddon Sundblom's now-familiar color head-and-shoulders portrait (using fellow Coca-Cola artist Harold W. McCauley as the model) debuted in 1957. The monochromatic 1969 Quaker Oats Company logo, modeled after the Sundblom illustration, was created by Saul Bass, a graphic designer known for his motion picture title sequences and corporate logos. In 2012, the company enlisted the firm of Hornall Anderson to give the 'Quaker man' a slimmer, somewhat younger look. The man is now sometimes referred to as "Larry" by insiders at Quaker Oats. And in 1965, a new advertising slogan was introduced: "Nothing is better for thee, than me". Members of the Religious Society of Friends have occasionally expressed frustration at being confused with the Quaker Oats representation. In recent years, Friends have twice protested the Quaker name being used for advertising campaigns seen as promoting violence. In 1990, some Quakers started a letter-writing campaign after a Quaker Oats advertisement depicted Popeye as a "Quakerman" who used violence against aliens, sharks, and Bluto. Later that decade, more letters were sparked by Power Rangers toys included in Cap'n Crunch cereal. From 1946-1953, researchers from Quaker Oats Company, MIT and Harvard University carried out experiments at the Walter E. Fernald State School to determine how the minerals from cereals were metabolized. Parents of mentally challenged children were asked for permission to let their children be members of a Science Club and participate in research. Being a member of the Science Club gave the children special privileges. The parents were told that the children would be fed with a diet high in nutrients. However, they were not told (and the consent form contained no information indicating) that the food their children were fed contained radioactive calcium and iron. The information obtained from the experiments was to be used as part of an advertising campaign. The company was later sued because of the experiments. The lawsuit was settled on 31 December 1997. In 2010, two California consumers filed a class action lawsuit against the Quaker Oats Company. Plaintiffs allege that Quaker marketed its products as healthy even though they contained unhealthy trans fat. Specifically, Quaker's Chewy Granola Bars, Instant Oatmeal, and Oatmeal to Go Bars contained trans fat, yet their packaging featured claims like "heart healthy," "wholesome," and "smart choices made easy." Plaintiffs' complaint cites current scientific evidence that trans fat causes coronary heart disease and is associated with a higher risk of diabetes and some forms of cancer. In 2014, Quaker agreed to remove trans fats from its products at a cost of $1.4 million, although they deny false or misleading labelling. ^ Matthew Herper and Betsy Schiffman (2 August 2001). "Pepsi Bought Quaker. Now What?". Forbes. Retrieved 21 January 2011. ^ Adams, Janky. "The Strait Dope Mailbag - Is the guy on the Quaker Oats Box John Penn?". Retrieved 15 August 2007. ^ Washington, Booker T. "Cereal Tycoon: The Biography of Henry Parsons Crowell: Joe Musser: Books". Amazon.com. Retrieved 18 January 2012. ^ "The Crowell Trust". The Crowell Trust. Retrieved 18 January 2012. ^ "Cereal Tycoon: The Biography of Henry Parsons Crowell: Joe Musser". Amazon.com. "Streaming Video (Stories & Testimonies: Givers) Any Man: The Story of Henry Parsons Crowell". Generousgiving.org. Retrieved 5 November 2017. ^ "Search Results: "Quaker Oats" : Prints & Photographs Online Catalog (Library of Congress)". Loc.gov. Retrieved 5 November 2017. ^ The Social and Economic Impact of World War II Munitions Manufacture on Grand Island, Nebraska, Nebraskahistory.org, 2014. ^ Company, Quaker Oats. "Country Pure Foods to Acquire The Quaker Oats Company's Ardmore Farms Business". Prnewswire.com. ^ "History of The Quaker Oats Company – FundingUniverse". Fundinguniverse.com. ^ "The Quaker Oats Company - Company History". Fundinguniverse.com. Retrieved 18 January 2012. ^ "Quaker Oats Sells Snapple At A $1". Morevalue.com. 28 March 1997. Retrieved 18 January 2012. ^ Brian Graney (18 September 2000). "Triarc Sells Snapple to Cadbury Schweppes [Breakfast With the Fool] September 18, 2000". Fool.com. Retrieved 18 January 2012. ^ "American Cereal Company". Ohio Historical Society. ^ "Peterborough Travel Guide: Peterborough, Ontario (ON) - WORLDWEB.COM". Peterborough-on.worldweb.com. ^ "Quaker Oats box label, circa 1920s". Crystalradio.net. Retrieved 5 November 2017. ^ "Quaker Oats Company Web Site - Quaker FAQ". Retrieved 22 January 2009. ^ "The Quaker Oats Guy Gets a Slimmer New Look". Time. 31 March 2012. Retrieved 3 January 2015. ^ "Identity Evolution - Quaker Oats, USA". Dianhasan.wordpress.com. 12 May 2011. Retrieved 5 November 2017. ^ Nassauer, Sarah (29 March 2012). "'Larry,' Quaker of Oatmeal Fame, Gets a Makeover". The Wall Street Journal. Retrieved 1 April 2012. ^ Adams, Cecil. "The Strait Dope Mailbag - Is the guy on the Quaker Oats Box John Penn?". Retrieved 15 August 2007. ^ Mendoza, A.J. "Beyond the Oatmeal Box". ^ Satterthwaite, Taylor Mary. "Quaker Problems". ^ "Chapter 7: The Studies at Fernald School". ACHRE Report. Retrieved 7 February 2016. It is clear that the doses involved were low and that it is extremely unlikely that any of the children who were used as subjects were harmed as a consequence. ^ "MIT and Quaker settle cereal suit". Sun Journal. 1 January 1998. Retrieved 3 January 2014. ^ Hussain, Zareena (7 January 1998). "MIT to pay $1.85 million in Fernald radiation settlement". The Tech. 11 (65). Retrieved 9 June 2009. ^ "Complaint against Quaker Oats" (PDF). PacerMonitor. PacerMonitor. Retrieved 22 June 2016. ^ Dariush Mozaffarian et al, "Trans Fatty Acids and Cardiovascular Disease", New England Journal of Medicine, 2006. ^ Frank B. Hu et al, "Diet, Lifestyle, and the Risk of Type 2 Diabetes Mellitus in Women", New England Journal of Medicine, September 2001. ^ Veronique Chajes et al, "Association between serum trans-monounsaturated fatty acids and breast cancer risk in the E3N-EPIC Study", Am J Epidemiology, 2008 June. ^ "Quaker settles trans fat labeling suit". Foodbusinessnews.net. Retrieved 5 November 2017. ^ Quaker: UK Trade Site. Quaker. Archived from the original on 15 November 2006. Retrieved 29 June 2009. Wikimedia Commons has media related to Quaker Oats Company.